How to manage spinal pain in dogs can be a difficult dilemma for veterinarians. Spinal pain in dogs is a common presenting complaint by owners that can be nebulous in origin yet indicative of a potentially serious, impending neurologic catastrophic event. Similar to the tip of the iceberg analogy, what presents as simple focal spinal pain without neurologic episodes can quickly progress to disastrous ship-sinking changes in mobility and paralysis. Management of spinal pain in dogs starts with a thorough physical and neurologic exam, knowledge of possible differential diagnoses, appropriate diagnostic testing, proper pain management, conveyance of exercise restriction to owner, and ultimately, expedient decision making for referral for advanced diagnostic testing and treatment. Sources of spinal pain include diseases affecting the vertebra, meninges, nerve root, disk and changes in intracranial pressure. The differential diagnoses of spinal pain can be categorized according to signalment, onset of signs (acute or be more progressive), focality (focal, multi-focal, or diffuse), location of signs. (Table 1). Table 1. Differential diagnoses of spinal pain in dogs by onset and location. Treatment is then based on decision making algorithm that to either pursue empirical medical management or to pursue advanced diagnostic testing, such as MRI scan and/or CSF collection and analysis. (Figure 1) The purpose of advanced testing is to provide additional treatment options (eg surgery) or to rule-out more serious non-surgical diseases (e.g. meningitis and neoplasia). Figure 1. 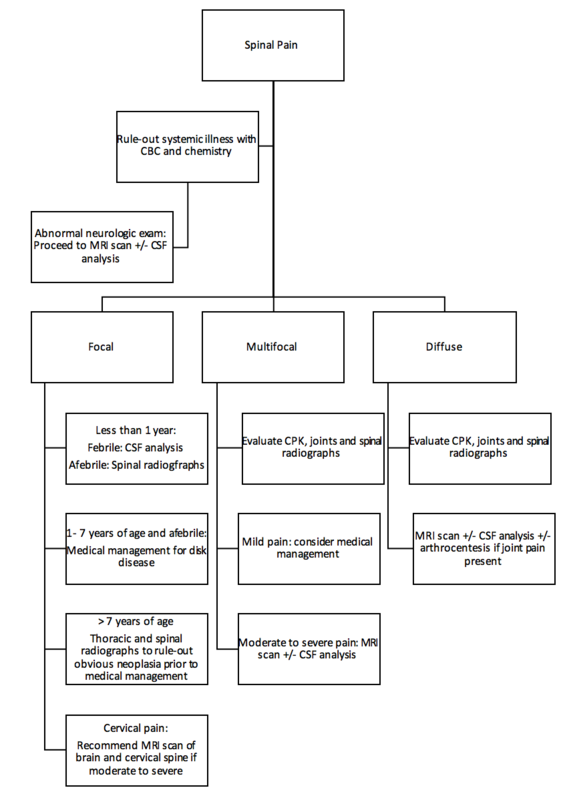 Decision-making algorithm for medical management of spinal pain in dogs. The decision to pursue empirical medical management is based on a number of factors. 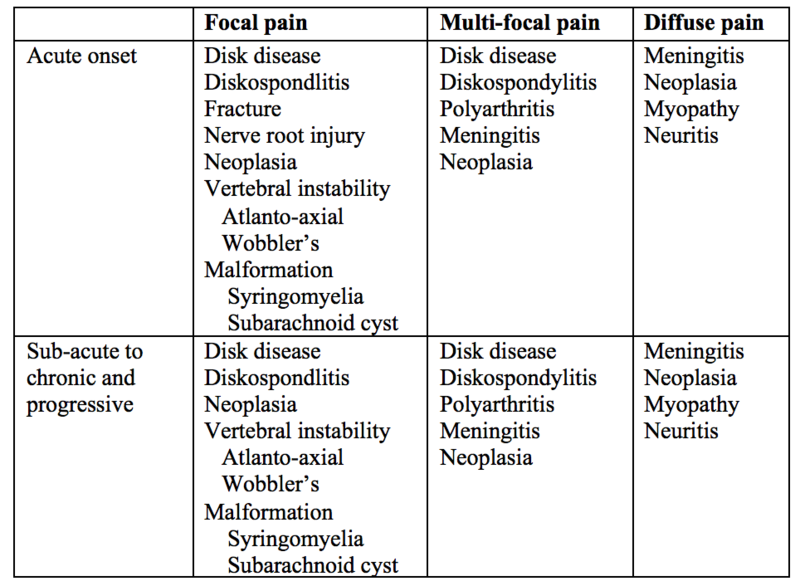 In general, chondrodystrophic breeds that are younger, with acute onset of focal spinal pain and normal physical and neurologic exam are more likely to have a disk-related pain. Some of these cases may present with vague signs of lethargy, tense abdomen and decreased appetite that could mimic abdominal related problems. Typically the lack of any vomiting or diarrhea is a clue that abdominal disease is not the cause. Older non-chondrodystrophic dogs should be evaluate for possible bone related neoplasia of the spine with radiographs prior to decision on medical management or MRI scan of the spine. Younger dogs with cervical pain and/or multifocal spinal pain with or without other neurologic signs should be assessed for infectious or immune-mediated meningitis with MRI scan and/or CSF analysis. Medical treatment of spinal pain is decided in the context of likely cause, any concurrent systemic diseases, and severity of signs. In general, a combination approach of anti-inflammatory drugs, C-fiber modulation therapy, narcotic therapy, activity restriction and complimentary therapy can be used. No studies have demonstrated an advantage of steroid vs non-steroidal anti-inflammatory therapy. Steroid therapy does come with potential adverse effects of increased thirst and urinations, possible GI effects, and idiosyncratic hepatic reaction in short term. Prednisone dosing of 0.5 mg/kg every 12 hours with a taper in 3 days to once a day for 3 days then every other day for 1 week is recommended. Non-steroidal therapy can also be used at an appropriate dose for that specific drug. Figure 2. 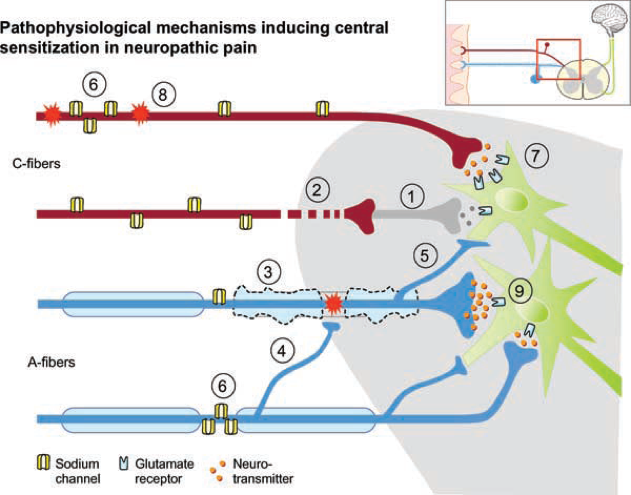 Pathophysiology of C-fiber pain pathway. Gabapentin reduces C-fiber transmission through the dorsal root ganglion (1). Gabapentin is the recommended first-line drug for use in dogs for treatment of neuropathic pain. Gabapentin is non-hepatic metabolized, has minimal drug-drug-interaction, rapidly metabolized and usually very well tolerated. Sedation is the most common adverse effect that can often be ameliorated with gradual dose up-titration. The recommended dose is as follows: 10 mg/kg every 12 hours for 1-2 days, then 10 mg/kg every 8 hours thereafter for at least 10 days. Incremental dosing up to 20 mg/kg every 8 hours as tolerated can be used for more severe pain. Supplemental short-term narcotic treatment can be very useful for more acute spinal pain. The use of a transdermal fentanyl patch is the recommended treatment with the advantage of rapid onset of action with sustained blood level over 24 to 48 hours when dosed at 2 to 3 mcg/kg. Concurrent use of mixed agonist-antagonist narcotic treatment (e.g. buprenorphine and tramadol) is not recommended due to counter-action against CNS fentanyl receptor activity. Activity restriction is probability the most important aspect of recovery from disk-related spinal pain. Adherence to strict confinement in a small area (4 x 6 feet) with only short walks, no jumping and minimal stairs for 7 to 14-day period is crucial to successful medical management. The use of acupuncture and laser therapy can be helpful as additional palliative therapy for spinal pain. Immediate relief for more severe pain can be seen within hours with acupuncture but the duration is equally short-lived. The biggest down-side is the need to transport the patient to a facility to can provide this treatment, which negates the benefit of activity restriction. Owners should be made aware of the goals, expectations and risks of medical management. Despite all of our good intentions, as clinicians, we cannot predict when and if the iceberg effect will occur. Any rapid decline in neurologic status, worsening of spinal pain or development of systemic signs (fever, vomiting/diarrhea, mentational alterations) should be dealt with as an emergency with immediate referral. Know that our MedVet team is always available to help you and your patient!